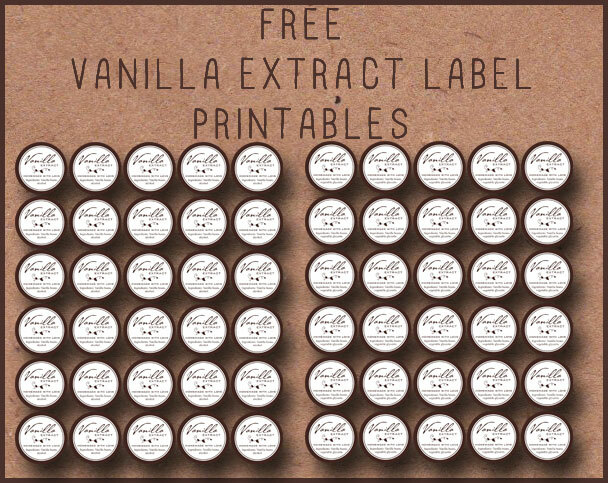 You are here: Home / Homemade / Making Homemade Pure Vanilla Extract from Scratch (Alcoholic and Non-Alcoholic) plus free printable tags! 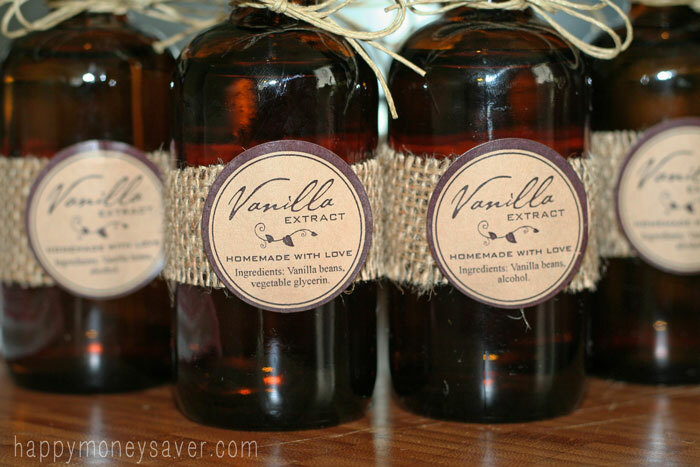 Making Homemade Pure Vanilla Extract from Scratch (Alcoholic and Non-Alcoholic) plus free printable tags! 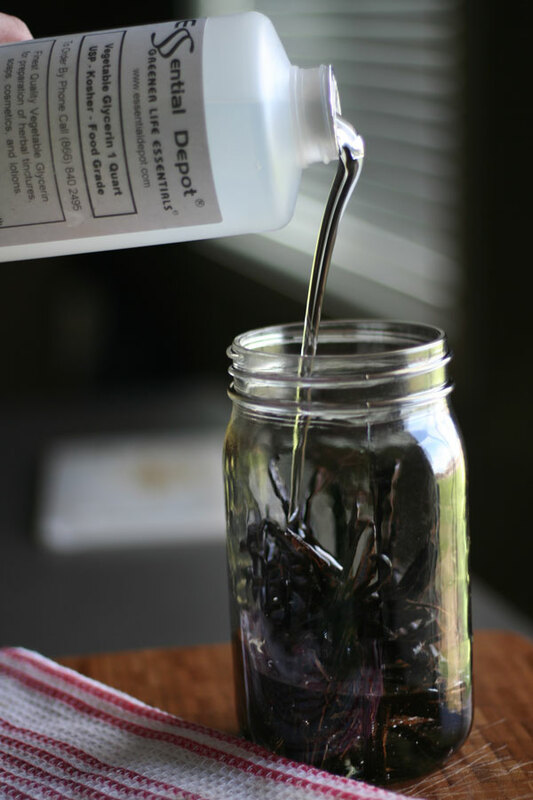 Yep, today I am sharing how to make homemade pure vanilla extract – from scratch! 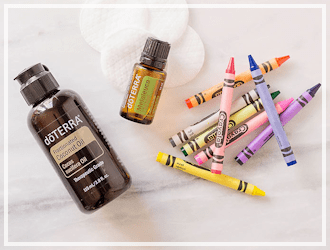 I cannot believe just how easy it was to make – you literally only need 2 ingredients. See, that doesn’t sound too hard now does it? You can totally do this. As you might know buying real vanilla extract can get expensive, but the flavor is amazing. 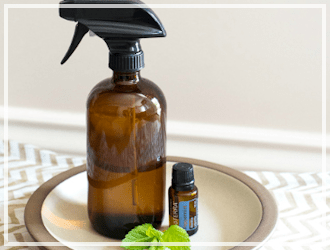 Making your own vanilla extract is a great way to save money and add that wonderful taste to all sorts of dishes. 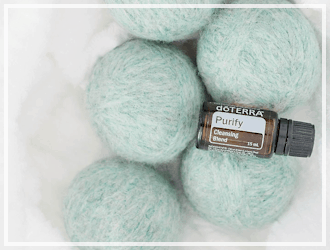 It takes a couple months to make your own, but if you start now (and use cute bottles), it would make a wonderful Christmas present for family and friends. When it comes to making homemade vanilla extract, there are two camps: alcohol and non-alcohol vanilla extract. 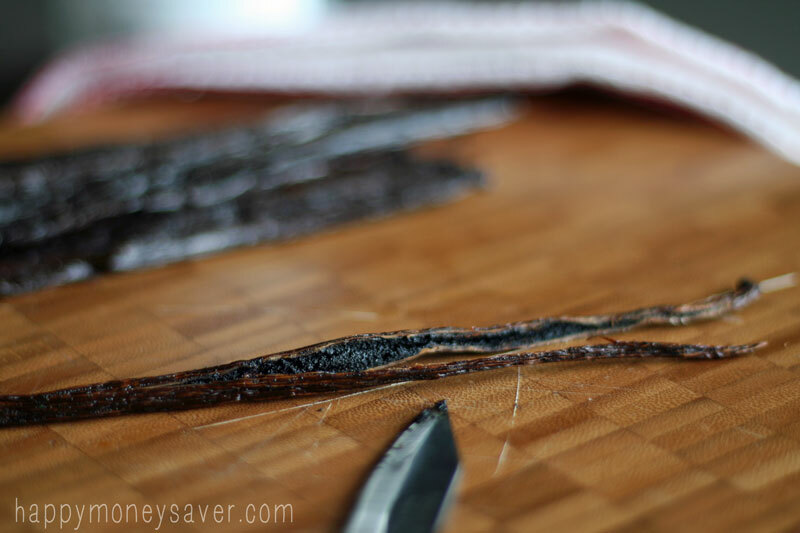 Cut the each vanilla bean in half lengthwise splitting them in down the middle, but leave an inch at the end that is still connected. Then cut the beans in half the other way so they are shorter to fit in the jar. For every 8 ounces, add in pieces of vanilla beans that total 3 or 4 whole beans. Pour the vodka over the beans so they’re completely covered in liquid. I bought a 40 oz. of vodka and it filled up my mason jar perfectly. I used 16 vanilla beans in my jar. 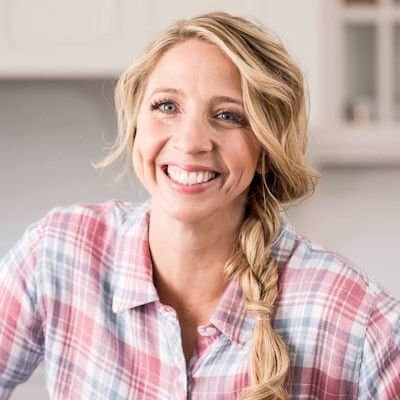 Next, place the cap or lid tightly on the bottle and put them in a cool, dark place (such as a closet or back of the pantry). Once a week, give the bottles a good shake. The length of time you give them will depend on how intense you want the flavor to be. Six to 8 weeks is plenty, or you can let it go longer. Once it’s done, use something like a coffee filter or flour sack towel to strain out particulates from the extract. Put it back in the bottle or split among smaller bottles for gifts. Many feel the amount of alcohol in the above recipe is very minimal, but if you’d prefer something alcohol-free, here’s how to avoid using vodka. The instructions are pretty much the same as with the above recipe. 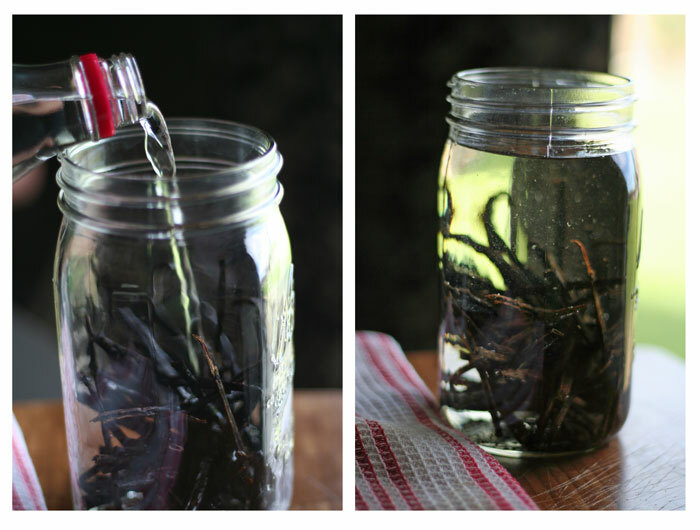 Cut and split the vanilla beans and place them in a jar with the glycerine. Put on the lid and store in a cool, dark place, shaking once a week. Takes about 6 to 8 weeks. This is my first time making homemade vanilla extract, so in 6 weeks I will come back and let you all know how it tastes with both types of vanilla. Not all vanilla beans will have the same flavor, so choose your vanilla beans according to your own preference. If you like vanilla extract that is more bold and smoky, Mexican vanilla beans are a good choice while Madagascar vanilla beans have more of a floral, fruity flavor and are a favorite among many. You can also experiment using different types of alcohol like rum or bourbon in place of vodka. Vodka is preferred because it typically is neutral in flavor so the flavor of the vanilla is more pronounced. Other liquor helps bring new dimensions of flavor to the extract. I’ve read that it’s possible to reuse the beans to make more extract. 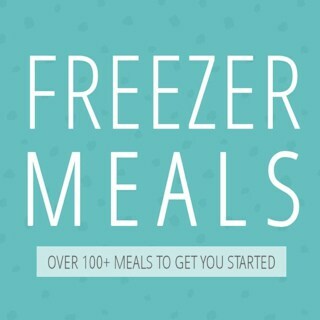 You can also grind up the beans and use them for recipes, including homemade ice cream. But is it worth the cost and time? Final price for 40 oz of homemade vanilla = $18.87 = $0.47 oz. Final price for 40 oz. = 17.32 = $0.43 oz. Online it says Costco’s 16 oz pure vanilla = $8.13 = $0.51 oz. and Walmart has Great Value pure vanilla at $2.48 per oz. So therefore it IS more cost effective to make your own, especially since it takes little effort to make it, just patience. Patience and time. Another plus is that I have heard you might be able to reuse the vanilla pods again after the first batch to make a second batch which would be a better deal. Update:: A reader looked in store at Costco and the vanilla is $6.99 for 16 oz, making it $0.44 per oz. So it might be more cost effective to just buy it there. 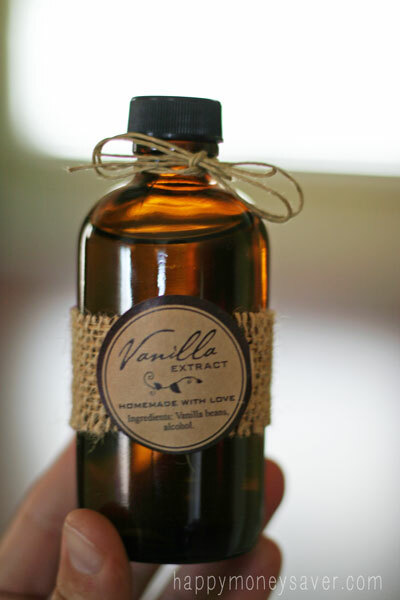 If you are doing the bottles for gifts though, including the bottles and price of homemade vanilla per oz. you pay only $3.63 per bottle! That IS ONE THRIFTY GIFT!! And it’s homemade so that is even better. If you think ahead you could have some really lovely homemade Christmas gifts for giving. I took a little bit of burlap, cut a one inch strip and used glue dots to wrap them around some amber colored bottles. Then I printed out these sweet labels that were created for you dear readers by Chelsea from ChelseWeilerDesigns. You can just print them out on some kraft colored paper or order these labels and print directly on them. Here are the links to purchase these items yourself. And if you would like the free printable all I require from you is your first born child and a chocolate cake. Okay, not really. You can have it for free…you know, cause I love you and all. 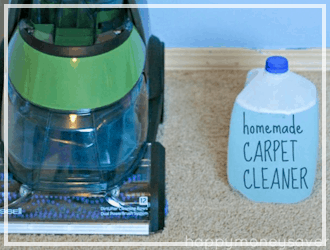 Click here for that Free Vanilla printable tag for the Non-Alcoholic recipe. 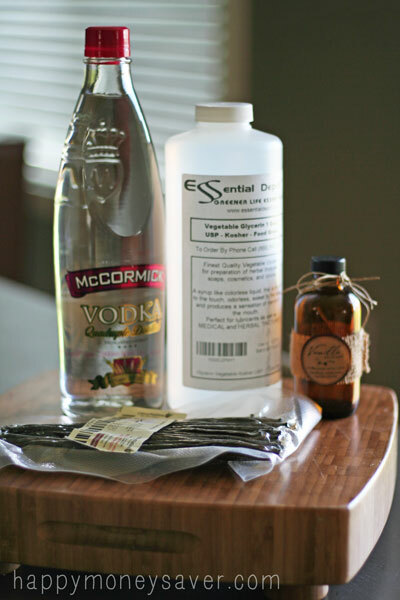 Making your own vanilla extract is easy and inexpensive! It also makes amazing gifts. 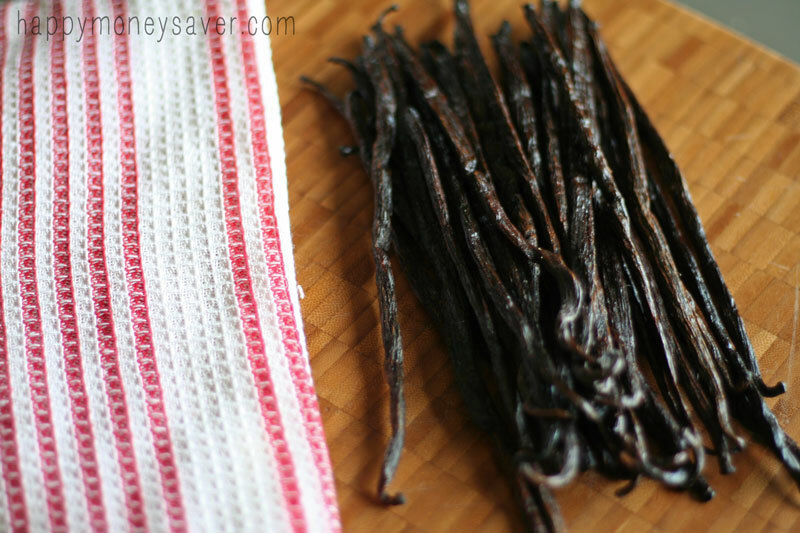 Cut and split the vanilla beans and place them in a jar with the vodka (use glycerine for a non-alcoholic version). Put on the lid and store in a cool, dark place, shaking once a week. In six to 8 weeks your vanilla extract will be ready to use. 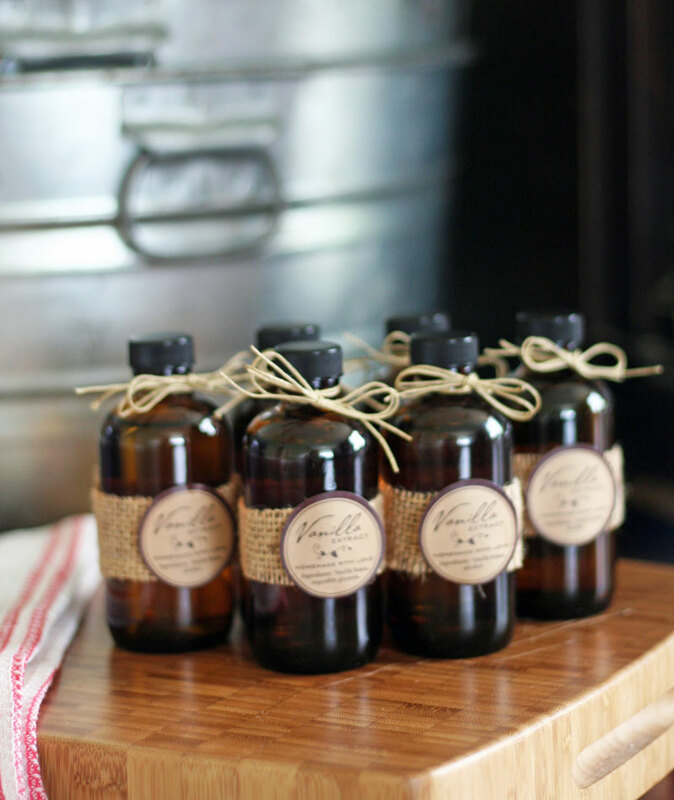 I hope you enjoyed learning about making your own homemade vanilla extract. 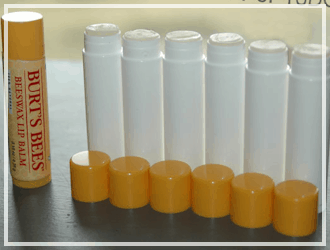 I am thinking of making a little homemade kit of “vanilla” themed products I made myself to give to my friends and family for Christmas this year. When I strain the vanilla beans after 6 weeks I hope to add them to another homemade soap batch. 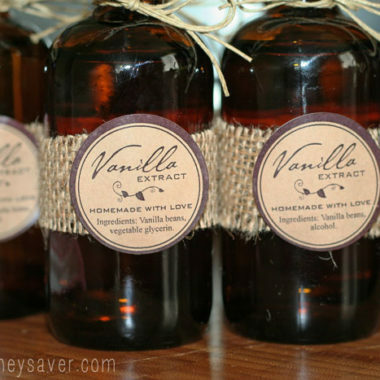 Have you made homemade vanilla before? It’s so exciting! Update: As of this date Costco’s PVE is now a whopping $27.69. More reason to diy. Thanks for the blog. Costco Vanilla is even higher in 2018: closer to $35 for the same $9.79 bottles a year ago!! Time to do my first attempt at vanilla. 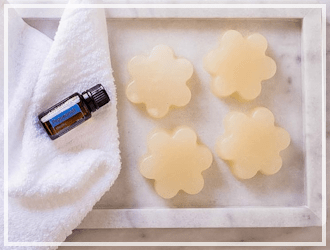 Does the glycerin preserve the vanilla as long as the vodka-based? I would like to re-use the beans again and need something that preserves the vanilla safely. Thanks!! Just one question. 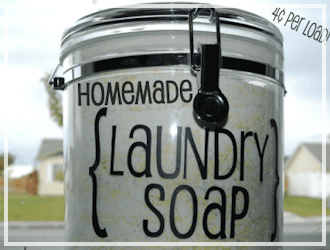 Would you know if I can use propylene glycol instead of Glycerin? Would it be better or worse? Thanks so much for posting this..
Hi! Thanks for this little tip! I wondering, what does your Pure Vanilla Extract mosquito repellant use as a base if not alcohol or anything with sugar? Even Vegetable Glycerin is a type of sugar? For those with gluten sensetivity, use a good quality potato vodka. I really liked both of them and so did the people I gave them out to. The consensus between most people was that the alcoholic version was closer to the original. But when cooking with the vanillas they both tasted great! I am in the process of making homemade vanilla from Madagascar beans with 40 proof Vodka. The beans have been marinating for 2 months. I then strained all the extract and bottled the extract into 8 oz clear, corked bottles and let sit in my dark, cool pantry. I went to get them for Christmas gifts and see that the neck of the bottles have an oily build-up. To say the least, it looked gross. I know the vanilla beans are naturally greesy but do you get this same build-up in your bottled vanilla? No, mine did not have an oily build up at all. I like to strain mine with a flour sack towel or superfine cheesecloth. Did you strain well enough I wonder? I was looking for a non alcoholic version and I found it here. Thanks a bunch. So sweet of you to have given the label link. Not many do. I should appreciate you for that.